Sudono Salim or Liem Sioe Liong (born in China, July 19, 1916 - died in Singapore, June 10, 2012 at age 95 years) is an Indonesian businessman. He is the founder of the Salim Group. Salim Group holdings include Indofood, Indomobil, Indocement, Indosiar, BCA, Indomaret, Indomarco, PT Mega, Bank Windu Kencana, PT Hanurata, and PT K. Golden and others. Additionally with Djuhar Sutanto, Sudwikatmono and Ibrahim Risjad (known as The Gangs of Four) founded a company in Indonesia's largest flour that is, PT Bogasari Flour Mill. At the time of the riots hit Jakarta in 1998, his house is located on Mount Sahari, Central Jakarta, became victims of vandalism and looting. After the incident, he began to shift its business to the stewardship of his son Anthony Salim, then moved and lived in Singapore until the age cap. 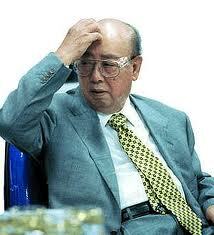 He is widely known by people close to former President Suharto's Indonesia-2. Continued his efforts that his son Anthony Salim and son Franciscus Welirang. Lie wife Las Nio (aka Lilani) Son of Albert Salim, Salim Andre, Anthony Salim, Salim Mira Salim Group is the largest conglomerate in Indonesia. The company was founded by Sudono Salim. The company has several subsidiaries, including Indofood, the world's largest instant noodle manufacturer and Bogasari, the company operating the largest flour. Salim Group also has an oil palm plantation (about 1.000 square kilometers) and logging concessions. Subsidiaries: Indosiar (15.23% joint venture with Eagle Technology Crown), Salim Palm Plantation, Yakult, Indofood, IndoAgri, Indomaret, Indomobil, Indocement, Nippon Indosari Corpindo (40%), Bogasari, BCA, Djarum, Nestlé, PepsiCo , Total Chemindo Loka, Unilever (75%), Wings, Lion Corporation. Sudono Salim was born in China, July 16, 1916. He married Lie Las Nio (Lilani) and has four children each Albert, Andre Halim, Anthony Salim, and Mira. A number of successful businesses started. Businessman Salim alias Liem Sioe Sudono Liong died at the age of 95 years in Singapore, Sunday (6/10/2012), at 15:50 local time. Founder of the Salim group is one of the leading businessmen in the country ever in the list of richest people. Sudono Salim known at the time of the new order. He is the founder and owner of the Central Bank of Asia in 1957 which later became Bank Central Asia (BCA) in 1960. He also founded the founder and owner of the Salim Group, PT Bogasari Flour Mill, PT Mega, Bank Windu Kencana, PT Hanurata, PT Indocement, and PT K. Kencana. The bodies of businessman Sudono Salim alias Liem Sioe Liong will be buried at Mount Vernon Funeral Parlours, Singapore, starting on Monday (6/11/2012) afternoon.